� CSF Demo out NOW! In the early morning of July 17 1943*, a small detachment of British commandos, assisted by Norwegian Resistance members, stormed the German defence forces at the Norwegian coastline and paved the way for the Allies to win the race for nuclear fission. This first engagement of the team called Commandos Strike Force was a turning point of World War II. This is a story of heroism and cowardice, kindness and brutality � the stuff of all great games. Get ready to be tested as the demo of Commandos Strike Force unfolds… this demo overview brought to you behind enemy lines by the brave members of TAFN contains spoilers of the full game, plus a brief walkthrough of the opening act for this extraordinary undertaking at the snowy mountains of Norway. Get ready! Get prepared! Commandos are back and are here to stay… Fire away! * Original historical date is classified and subject to change. Firstly it isn't possible in the demo to dual wield the machine gun you start with (there doesn't seem to be another one), the germans use their trusty mp40 so you'll need to pick those up. To do this first kill a soldier with a mp40 then run to him and press F to pick it up. You'll loose one of your other guns though. I'm sure there's a way to decide which one but by lack of a manual I don't know. Ok so now you have one mp40 but you'll need another one so when you see another dead soldier with a mp40 walk over it and you'll pick it up. After you've done that you'll have two mp40's in your inventory you'll just need to activate them. You'll need to use the é key (might be different on your keyboard it is under controls, other, next item) to switch from you're grenade to the icon you see below. (don't mind the bad performance I was concentrating on dual wielding guns rather than playing well) After you see the icon that is marked with red on the screen press the left ALT (also default) to activate it. 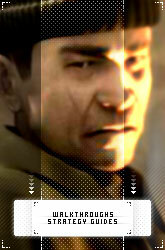 marins from http://www.commandos.cenega.net has managed to extract all the artwork that you will be able to unlock in the full game by completing the missions. Now before I give you the links be advised that if you're watching them now it will be less rewarding - aside from pleasing your ego because you completed the mission - to finish the missions in CSF. Thanks again to marins ! Some very talented people over at Pyro! IGN have putted up a hands on preview of Commandos Strike Force. The write up is basicly more of a demo impression but it's a nice read. They got some small movies showing of the demo as well so check it out if you haven't played the demo yet and need to be convinced. Additionally according to Dazzo1987 from the Eidos forums, PC gamer gave CSF a nice 85 % score. UPDATE: 1UP have putted up their preview as well, looks like they're not completely sure yet. 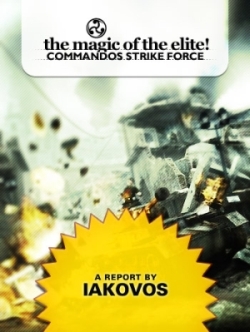 Eidos Unleashes the PC Demo and Box Art for Commandos Strike Force!!! Eidos releases the PC Demo as well as the Official Box Art for Commandos Strike Force, the intense stealth combat game. The latest edition of the Commandos series redefines the franchise by fusing first-person action and stealth gameplay. Play as one of three elite members of the Commandos Strike Force Team, each with their own unique strengths and abilities. Switch seamlessly between Commandos during gameplay, take control and determine what tactics and approach you want to utilize to complete a mission. Experience an angle of World War II that you have not seen before, as you infiltrate behind enemy lines to strike where it hurts the most. The PC Demo features two different playable levels. The first level lets you lead an ambush utilizing the abilities of the Green Beret Francis O'Brien, and the Sniper William Hawkins. Strategize and switch on-the-fly between both Commandos as you battle your way up a mountain pass. 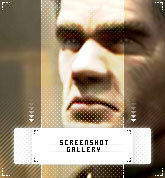 In the other level you get to play as the Spy George Brown. This training level drops you in the French countryside, where you stalk the enemy and strike when they least expect it, all while teaching you the basic skills you'll need in the process. To download the demo, please visit the Eidos Interactive download section Commandos can do what armies cannot, April 4th, 2006 in North America! To arms soldier! It's War! The Commandos Strike Force demo has been officialy released! The Commandos Strike Force singleplayer demo contains 2 missions from the full game. One being a training mission in which you control the Spy (stealth mission.) And another - action packed - mission in which you control the Green Beret and Sniper, being assisted by members of the Norwegian Resistance. You can download the demo from our Downloads dB. Feel free to give your constructive feedback about the demo here. And while your downloading this massive 638MB demo, go have a look at these demo screens. Enjoy! UPDATE: if you know of any mirrors let us know and we'll add them! All mirrors we add will and are currently shown in our downloads database, once you click the download button you can choose your location! Thanks to: GamersHell, 3DGamers, GameGuru Mania, GameCloud, BoomTown, AmbientHost, GameDaily, BluesNews, ShackNews, WorthPlaying, 1UP, Ve3D and FileFront! Despite earlier reports from Tom in this place (and from me on the forums) the demo will be online for all Friday morning. Now of course I could've just edited Tom's post but I wanted to wait untill we were certain. That and I'm secretely planning to be the sole poster of Commandos news but don't tell anyone.